As in many other parts of the country, Northland has been wet, contributing to a traditionally subdued winter rural property market. One notable transaction was a 148 hectare west coast farm that sold in July between $20,000 and $22,000 per hectare, at the upper end of the price range for the region’s dairy properties. Market activity is set to increase in the spring, with indications that several of the region’s older farmers are preparing to exit the sector, moving on or retiring in the coming months. Listings of their farms will be welcomed by motivated buyers, operating in what remains a sellers’ market. In Northland last year, the main farm selling season was late to properly commence. Although this year has seen some early action, more meaningful activity is likely in December and January then in the spring. Waikato’s winter rural property market was unspectacular. A shortage of enthusiasm from the banks towards lending on farm purchases, and generally wet and unfavourable weather, magnified what is usually a quiet season anyway. Although a more positive outlook has returned for the dairy sector, Waikato farmers are not yet ready to purchase additional land, seeking to consolidate their equity position before expanding. Some interesting drystock properties are likely to come onto the market in the King Country. These aside, with such sparse market activity over the past few months, how the spring will proceed is difficult to predict. It is likely, though not certain, that price expectations will remain consistent and there will be no major surge in the region’s listings, in which case, a reasonably typical balance will prevail between supply and demand, and a normal spring market will play out. A relatively quiet winter rural property market prevailed in the wider Bay of Plenty. Owners preferred to take advantage of excellent commodity prices, rather than cashing in on farm and orchard values. Positive winter enquiry for drystock property largely went unmet. Smaller production orchards able to convert to gold G3 kiwifruit are especially sought after as growers anticipate profitability on orchard gate returns of well over $100,000 per canopy hectare in the coming season. While supply and demand for dairy farms is steady, farmers looking for grazing blocks are generally unsatisfied. Good flat land between 30 and 100 metres above sea level may not be affordable for dairy support as horticulture offers a superior return on the same land. 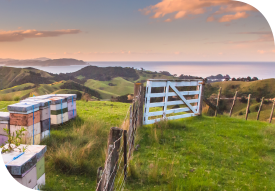 Substantial market improvement should occur through spring as Bay of Plenty property owners respond more favourably to the steady and rising demand for all land use types. Taranaki rural property sales were ahead of last winter by more than 30 per cent, with the region’s top sale a 79 hectare grazing property that changed hands for more than $7 million or almost $90,000 per hectare. Also in the region, a 564 hectare forest sold for $2 million. Taranaki dairy farm sales are averaging between $40,000 and $45,000 per hectare, while finishing and grazing farms in the region are selling on average price between $16,000 and $19,000 per hectare. A 632 hectare Whanganui grazing property sold for $8.9 million, while two other traditional Whanganui grazing properties, of 632 and 828 hectares, each sold at slightly above $4,000 per hectare. With dairy farmers increasingly confident and having paid down debt recently, more selling activity is likely in traditional dairy areas during the spring. Sales volumes in the region were similar to the same period last year. Average values for Wairarapa dairy farm sales are approximately $30,000 per hectare at present, while a 294 hectare Horowhenua dairy property sold for $14.5 million or just short of $50,000 per hectare. A 603 hectare Wairarapa finishing farm sold for $9.3 million. Large-scale sheep and beef grazing and finishing, dairy and arable farms are in hot demand in the region. Allandale, a widely admired 393 hectare Greytown grazing property currently used for dairy support will list for sale during the spring and should attract considerable attention. Good-quality properties situated in sought-after locations, with reliable rainfall, superior improvements and proven performance, remain in demand. A range of good-quality sheep and beef farms coming onto the market in spring should satisfy this, in part at least. Values of Hawke’s Bay rural property offered to the market over the last few months remained consistent with those that sold in the autumn, with all recent transactions of economic farm units at or above $10,000 per hectare. As expected during the winter, a relative lack of listings slowed the volume of sales, despite reasonable values. Firm and improving product prices, particularly for beef, though also more recently for dairy, are the major factors influencing the region’s rural property market. Consequential demand for additional land is keeping buyers motivated and sellers satisfied. Into the spring, market activity should increase. At least three high-quality sheep and beef properties are set to go to auction in Hawke’s Bay later in the spring, presenting purchasers with some excellent opportunities. Values are unlikely to alter significantly.